The purpose of this study was to assess the incidence, location, and sizes of the accessory mental foramina in Bulgarian population using Cone-Beam Computed Tomography (CBCT). The CBCT records of 1400 Bulgarian patients were evaluated for Accessory Mental Foramina (AMF) by two expert radiologists familiar with CBCT interpretation. Their presence and location in relation to the Mental Foramen (MF) were assessed using axial, panoramic and cross-sectional 2-dimensional CBCT images. The long and short axes diameters of the AMF were also measured. Accessory mental foramina were observed in 3.86% of the patients: up to two foramina on one side, unilaterally presented in 94.4% of cases with AMF. Their location regarding MF was distally and inferiorly in 62.9%. In 35.5 % of cases with AMF the foramen was situated above the level of MF and therefore needs special attention before surgery. The mean inner long and short axis diameters were 1.5 mm (SD: 0.4 mm) and 1.2 mm (SD: 0.3 mm) respectively. The measurements ranged from 0.7-2.5 mm for the long axis and 0.7-2 mm for the short axis. Demonstration of AMF using CBCT can improve the surgery treatment planning in anterior part of the mandible and thus helps to avoid unwanted neurovascular damage and possible malpractice litigations. This is the first study about the incidence, location, and sizes of the accessory mental foramina in Bulgarian population and adds additional information regarding the Caucasian race. The Mental Foramen (MF) represents the terminal part of the mental canal. Its position is clinically important for dentists and maxillofacial surgeons. Toh et al. considered that separation of the mental nerve being earlier than the formation of the mental foramen could be a reason for the formation of the accessory mental foramina . It is important to differentiate Accessory Mental Foramina (AMF) from nutritive vascular canals and fistulas. Supplementary blood vessels or nerves in AMF may be significant for anesthesia procedures and the knowledge about their presence could be used to avoid post-operative complications (hemorrhages and sensory disturbances) during implant installations [2-4]. Small bony canals and foramina e.g. accessory mental foramina can be observed using conventional radiographs, Computed Tomography (CT) or Cone-Beam Computed Tomography (CBCT). Conventional radiographs could not precisely identify the presence and the course of the mandibular canal, the mental foramen and the accessory mental foramina due to the distortion of the image or the low contrast between the foramen and the mandibular trabecular bone . Naitoh et al. detected only 18 accessory mental foramina using panoramic radiographs in contrast with CBCT which reveal 37 accessory mental foramina . Today CBCT provides reliable data for correct distance measurements and can be used to obtain detailed information for three-dimensional analysis of the bone structures . It must be emphasized on the fact that unless the diagnostic information provided through CBCT improves treatment results, CBCT should not be recommended for use in children or adolescents . Using CT or CBCT a precise accessory mental foramen analysis is only possible due to the better quality and lower distortion in comparison with conventional radiographs . The great variety of surgical interventions in the chin region including oral implants placement, bone grafting, apical osteotomy etc. require an exact information about critical anatomical structures like mandibular canal, mandibular incisive canal, anterior loop of mandibular canal, lingual vascular canals, mental foramina and accessory mental foramina. CT or CBCT are reliable diagnostic tools for this purpose. Clinical and radiographic studies that investigate AMF are less frequent. Small proportion involves CT and CBCT examination and some of them include only case reports or relatively small groups of patients [5,9-11]. The study included 1400 CBCT scans taken in 7 y period as a part of preoperative planning of implant placement. CBCT images were retrospectively evaluated. The group consisted of 700 female and 700 male patients; mean age of 46.7 y (range 18-78). All of them were Bulgarians from Caucasian race. Patients with anamnesis of surgical procedures in the anterior mandible or evidences of any disorders (skeletal asymmetries, traumas etc.) that can influence the normal anatomy related to MF and AMF were excluded from the study. Images with low quality e.g. due to subtle movements during the exposure or with metal artifacts also were excluded. All patients had given their informed consent for this examination. The study protocol was carried out in accordance with the principles described in the Declaration of Helsinki, including all amendments and revisions. Only the investigators had access to the collected data. All CBCT scans (ILUMA™, Imtec Imaging, Ardmore, OK) were performed using a standard exposure and patient positioning protocol (120 KV, 40 s, 3.8 mA). The data were reconstructed at a voxel size of 0.3 mm. AMF were identified and measured using Kodak Dental Imaging Software (KDIS 3D module v. 2.0) for visualization. For identification of the AMF and their location, an expert consensus statement (n=two experts radiologists familiar with CBCT interpretation) was used as the gold standard because of the inherent limitations of a clinical observational study. The mental foramen was defined as the largest foramen in premolar area and the accessory mental foramen was the additional one originating from the mandibular canal. The x-axis (parallel to the occlusal plane) and y-axis (passing through the MF and perpendicular to the x-axis) were used to define the position of AMF as distal-superior, distal-inferior, medio-superior or medio-inferior. Axial, panoramic and cross-sectional images were carefully examined manually using the thinnest possible slices-0.3 mm. Panoramic image of each patient was reformatted using manually driven arch curve located between the buccal and lingual compact layers of the mandible. The MF and AMF were identified initially in axial plan (on full screen) and confirmed using the panoramic and cross-sectional images. In case of need the radiologists were free to use other slice thickness or different slice sequence to be sure about MF and AMF presence. The long and short axis internal diameters of the AMF were measured three times in different days by one observer experienced in measurements on CBCT images. The average values of the measurements were used for the analysis (Figure 1). 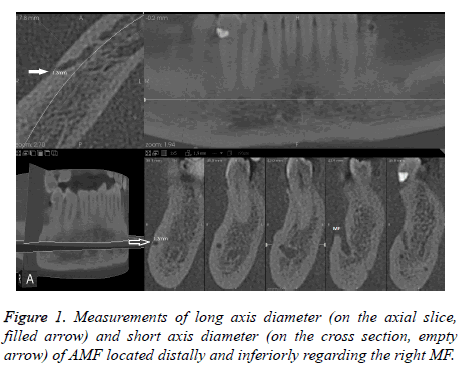 Figure 1: Measurements of long axis diameter (on the axial slice, filled arrow) and short axis diameter (on the cross section, empty arrow) of AMF located distally and inferiorly regarding the right MF. Prior to the actual observations, an interexaminer calibration had been performed. A blinded pilot study of 13 dry human mandibles was done (n=26 hemimandibles). They were scanned with the same CBCT unit and exposure data and the images were analysed for presence of AMF from the two observers. On the crossectional images one AMF was found. The same foramen was subsequently found on the dry mandibles set inspection. All data were gathered and statistically analysed by SPSS 16.0 (SPSS Inc., Chicago, Illinois, USA). P-values of 0.05 or less were considered statistically significant. Kappa statistics were applied for assessment of interobserver agreement. The kappa coefficient was interpreted as being poor (0), slight (0.01-0.20), fair (0.21-0.40), moderate (0.41-0.60), substantial (0.61-0.80), and almost perfect (0.81-1.0) according to Landis and Koch . Regarding the measurement of the AMF diameters, the intraobserver variations were expressed by the Coefficients of Variation (CV). Categorical data (e.g. gender and side differences) were evaluated using chi-square statistics. The kappa statistics indicated an overall score of 0.86 for the interobserver agreement in identification of AMF and score of 0.81 for the interobserver agreement regarding their location. These scores as compared to the expert consensus statement showing almost perfect agreement between observers for the identification and localization of the accessory mental foramina. The intraobserver CV for the measurements of the long and short axes diameters yielded very small values (scores of 0.27 and 0.25). In this study the bony canal leading to the AMF originating from the most medial part of the mandibular canal, near to MF and they vary up to two one-sided. Regarding the incidence, AMF was found in 3.86% of the cases (n=54 out of 1400 patients, n=62 AMF). No predilection was found about the occurrence between genders (χ2=1.1, p>0.05). In our group 3.5 % (n=49 out of 1400) patients had single and 0.36 % (n=5) double AMF on one side. None triple AMF cases in our study were found. The frequency of accessory mental foramina on the right side was 1.86% (n=26 out of 1400 patients), respectively 2.21% (n=31) for the left side, including three patients with bilateral AMF. No predilection was found about the occurrence between both sides (χ2=0.44, p>0.05). Unilateral AMF (up to two) were the main part-94.4% (n=51 out of 54) of all AMF cases. Their incidence in the whole group was 3.6% (n=51 out of 1400) and for the bilateral location was 0.21% (n=3). In order to avoid neurosensory disturbances related to AMF, before surgery it is essential to have information about their exact position. The location of accessory mental foramina in our study was Distal-Inferiorly (DI) in 62.9 % (n=39 out of 62 AMF cases). Distal-superiorly was the position in 22.6% (n=14), medioinferiorly in 1.6 % (n=1) and in 12.9 % (n=8) accessory mental foramina were medio-superiorly located. The mean inner long and short axis diameters of AMF were 1.5 mm (SD: 0.4 mm) and 1.2 mm (SD: 0.3 mm) respectively. The measurements for the long axis ranged from 0.7 mm to 2.5 mm and for the short axis vary from 0.7-2 mm. To our best knowledge no study has been published concerning accessory mental foramina in Bulgarian population examined by CBCT. In our study the incidence of AMF was 3.86% without gender predilection. These results are in accordance with other researches [11,13-16]. Large number of studies showed that incidence of AMF varies largely: 1.4% in American Whites, 1.5% in Russians, 2.6% in French, 3.0% in Hungarians, 3.6% in Egyptians, 5.7% in American Blacks, 7% in Japanese and Polish patients, 9.7% in Melanesians and up to 13% in Indian [1,11,13,15-17]. According to these data our results are close to those of Hungarians and Egyptians. In this study 3.5 % patients had single and 0.36 % double AMF on one side. Our data are consistent with earlier studies reporting occurrence of single AMF from 1.8% to 10.6% [2,18-21]. Double AMF occurrence in our results (0.36%) is slightly lower in comparison with other studies. Incidence of 0.6% reported Katakami et al., 0.7 %-Gershenson et al., 0.72 %- Apinhasmit et al. and 1.2 %-Naitoh et al. [11,19,20,22]. The differences are probably related with study design, different imaging techniques, ethnic and racial peculiarities. None triple AMF cases in our study were found. Triple AMF (quadruple MF) are extremely rare-incidence of 0.19 % according to Gershenson et al. . Bilateral AMF incidence varies from 0.53 % to 1.26 % in other investigations and slightly differs from ours-0.21% [11,20,23]. Cases with AMF located inferiorly to the mental foramen have lower significance for the planning when it is based on the MF location . Our results are in accordance with several studies founding that the position of AMF was usually inferiorly or distal-inferiorly to the MF-location sufficient for most surgical procedures [20,24,25]. Cases with AMF located above the level of MF are supposed to be more clinically significant because of higher risk for surgical injury during implantation or endodontic surgery [6,11]. Our results shows that approximately 1/3 from Bulgarians have AMF above the MF that could be damaged. Some authors stated that accessory mental foramina are usually less than or near to 1.0 mm in size [1,21,23]. Results from other studies are slightly different. Katakami et al. reported the median horizontal and vertical diameters of AMF were 1.6 mm (range, 0.7-2.6 mm) and 1.2 mm (range, 0.5-2.2 mm) . The mean long axis diameter was 1.9 mm according to Naitoh et al . Our results are similar to these of Katakami et al. and Naitoh et al. and shows that 90.3% (n=56) of all accessory mental foramina (n=62) were greater than 1 mm at least in one of both measured dimensions. Some authors state that smaller canals with a diameter of less than 1 mm have low probability to cause a major hematoma, but larger canals have to be mentioned in the radiologic reports and considered during the preoperative planning procedures [26-28]. Our data shows that accessory mental foramina bigger than 1 mm represent a large group and a special attention should be paid to this anatomical variant. The results of this study show 3.86 % occurrence of AMF on all CBCT scans. No predilection was found concerning the occurrence between both sides and between genders. AMF is unilateral finding in 94.4% of cases with accessory mental foramina. The location of AMF is distal-inferiorly in 62.9% of cases, but in 35.5% the foramen is situated above the MF and this leads to the possibility for injury during apical osteotomy, dental implantation etc. The mean short axis diameter of AMF was found to be 1.2 mm (SD: 0.3 mm) and the long axis diameter was 1.5 mm (SD: 0.4 mm). In most of cases with AMF were measured at least one dimension greater than 1 mm-90.3%. Accessory mental foramina located above the level of MF (35.5% in our study) needed special attention before surgery in this area. The presence of mandibular and mandibular incisive canals, lingual mandibular canals and MF position are very important too and also should be kept in mind. Demonstration of accessory mental foramina using CBCT can improve the surgery treatment planning in anterior part of the mandible and thus helps to avoid unwanted neurovascular damage and possible malpractice litigations. This is the first study about the incidence, location, and sizes of the accessory mental foramina in Bulgarian population and adds additional information regarding the Caucasian race. Toh H, Kodama J, Yanagisako M, Ohmori T. Anatomical study of the accessory mental foramen and the distribution of its nerve. Okajimas Folia Anat Jpn 1992; 69: 85-88. Haktanir A, Ilgaz K, Turhan-Haktanir N. Evaluation of mental foramina in adult living crania with MDCT. Surg Radiol Anat 2010; 32: 351-356. Hasan T. Mental foramen morphology: a must know in clinical dentistry. J Pak Dent Assoc 2012; 21: 168-173. Pancer B, Garaicoa-Pazmiño C, Bashutski JD. Accessory mandibular foramen during dental implant placement: case report and review of literature. Implant Dent 2014; 23: 116-24. Torres MGG, Valverde LF, Vidal MT, Crusoe-Rebello IM. Accessory mental foramen: A rare anatomical variation detected by cone-beam computed tomography. Imag Sci Dent 2015; 45: 61-65. Naitoh M, Yoshida K, Nakahara K, Gotoh K, Ariji E. Demonstration of the accessory mental foramen using rotational panoramic radiography compared with cone-beam computed tomography. Clin Oral Implants Res 2011; 22: 1415-1419. Eren H, Orhan K, Bagis N, Nalcaci R, Misirli M,Hincal E. Cone beam computed tomography evaluation of mandibular canal anterior loop morphology and volume in a group of Turkish patients. Biotechnol Biotechnolog Equip 2016; 30: 346-353. Orhan AI, Orhan K, Aksoy S, Ozgul O, Horasan S, Arslan A, Kocyigit D. Evaluation of perimandibular neurovascularization with accessory mental foramina using cone-beam computed tomography in children. J Craniofac Surg 2013; 24: 365-369. Benghiac AG, Costan V, Dumitrescu AM, Haba AS, Haba D. Anatomical variations of the mental foramen assessed by cone-beam computed tomography. Revista Romana De Anatomie Functionala Si Clinica, Macro-si Microscopica Si De Antropologie 2015; 14: 28-34. Garay I, Cantin M. Accessory mental foramina assessed by cone-beam computed tomography: report of unilateral and bilateral detection. Int J Morphol 2013; 31: 1104-1108. Naitoh M, Hiraiwa Y, Aimiya H, Gotoh K, Ariji E. Accessory mental foramen assessment using cone-beam computed tomography. Oral Surg Oral Med Oral Pathol Oral Radiol Endod 2009; 107: 289-294. Landis JR, Koch GG. The measurement of observer agreement for categorical data. Biometrics 1977; 33: 159-174. Jaju PP, Jaju SP, Garcha V. Accessory mental foramina detection by cone beam CT in indian population. Smile Dent J 2013; 8: 32-37. Khojastepour L, Mirbeigi S, Mirhadi S, Safaee A. Location of Mental Foramen in a Selected Iranian Population: A CBCT Assessment. Iran Endod J 2015; 10: 117-121. Sawyer DR, Kiely ML, Pyle MA. The frequency of accessory mental foramina in four ethnic groups. Arch Oral Biol 1998; 43: 417-420. Zmyslowska-Polakowska E, Radwanski M, Leski M, Ledzion S, Lukomska-Szymanska M, Polguj M. The assessment of accessory mental foramen in a selected polish population: a CBCT study. BMC Med Imaging 2017; 17: 17. Singh R, Srivastav AK. Estudio de la posicion, forma, tamano e incidencia del foramen mentoniano y foramen mentoniano accesorio en craneos humanos de Indios adultos. Int J Morphol 2010; 28: 1141-1146. Agthong S, Huanmanop T, Chentanez V. Anatomical variation of the supraorbital, infraorbital, and mental foramina related to gender and side. J Oral Maxillofac Surg 2005; 63: 800-804. Gershenson A, Nathan H, Luchansky E. Mental foramen and mental nerve: changes with age. Acta Anat (Basel) 1986; 126: 21-28. Katakami K, Mishima A, Shiozaki K, Shimoda S, Hamada Y, Kobayashi K. Characteristics of accessory mental foramina observed on limited cone-beam computed tomography images. J Endod 2008; 34: 1441-1445. Paraskevas G, Mavrodi A, Natsis K. Accessory mental foramen: an anatomical study on dry mandibles and review of the literature. Oral Maxillofac Surg 2015; 19: 177-178. Apinhasmit W, Methathrathip D, Chompoopong S, Sangvichien S. Mental foramen in Thais: an anatomical variation related to gender and side. Surg Radiol Anat 2006; 28: 529-533. Imada TS, Fernandes LM, Centurion BS, de Oliveira-Santos C, Honorio HM, Rubira-Bullen IR. Accessory mental foramina: prevalence, position, and diameter assessed by cone-beam computed tomography and digital panoramic radiographs. Clin Oral Implants Res 2014; 25: 94-99. Kalender A, Orhan K, Aksoy U. Evaluation of the mental foramen and accessory mental foramen in Turkish patients using cone-beam computed tomography images reconstructed from a volumentric rendering program. Clin Anat 2012; 25: 584-592. Neves FS, Nascimento MC, Oliveira ML, Almeida SM, Boscolo FN. Comparative analysis of mandibular anatomical variations between panoramic radiography and cone beam computed tomography. Oral Maxillofac Surg 2014; 18: 419-424. Gahleitner A, Hofschneider U, Tepper G, Pretterklieber M, Schick S. Lingual vascular canals of the mandible: evaluation with dental CT. Radiology 2001; 220: 186-189. Greenstein G, Cavallaro J, Tarnow D. Practical application of anatomy for the dental implant surgeon. J Periodontol 2008; 79: 1833-1846. Liang X, Jacobs R, Lambrichts I. An assessment on spiral CT scan of the superior and inferior genial spinal foramina and canals. Surg Radiol Anat 2006; 28: 98-104.